Box Text: THE WORLD WILL END IN THREE DAYS. CAN YOU STOP THE APOCALYPSE IN TIME? 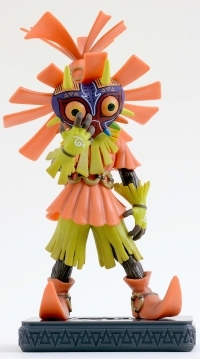 A twisted Skull Kid will destroy the world in three days by sending the moon crashing down. To stop him, Link must collect powerful masks and relive those final days in many unexpected ways. Wear special masks to transform. Swim with ease as a graceful Zora. Roll over enemies as a mighty Goron. Track progress in the Bomber's Notebook. 04-16-2016 mrfoxhound Box Text THE WORLD WILL END IN THREE DAYS. CAN YOU STOP THE APOCALYPSE IN TIME? 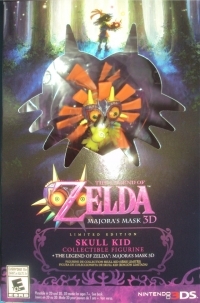 A twisted Skull Kid will destroy the world in three days by sending the moon crashing down. To stop him, Link must collect powerful masks and relive those final days in many unexpected ways. Wear special masks to transform. Swim with ease as a graceful Zora. Roll over enemies as a mighty Goron. Help and befriend Termina's intriguing residents Track progress in the Bomber's Notebook. 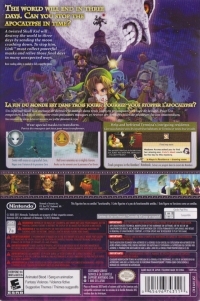 This is a list of VGCollect users who have Legend of Zelda, The: Majora's Mask 3D Limited Edition in their Collection. This is a list of VGCollect users who have Legend of Zelda, The: Majora's Mask 3D Limited Edition in their Sell List. This is a list of VGCollect users who have Legend of Zelda, The: Majora's Mask 3D Limited Edition in their Wish List.